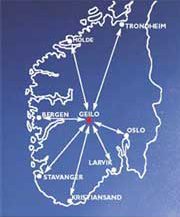 Ustedalen Hotel in Geilo, is situated only 800 meters from the town center, and close to all of Geilos facilities. Bike and ski-trails passes just outside the hotel, and the beautiful surroundings are available just outside the doorstep. Ustedalen Hotel can be found in Gamlevegen 32 on Geilo. From the center of Geilo, follow RV 7, or the old road parallel to the railway tracks 800 meters to the west (towards Bergen), and you will see the Hotel. You can`t miss it.